This feature aims to provide an insight into the evolution of rope rescue and safe working at height in Greater Manchester Fire and Rescue Service (GMFRS) from the 1980’s up to 2015 when I retired after 30 years’ service. “Keep your foot on the line!” This was the cry that was the accepted practice in the 1980’s, and went up when lowering by line under foot, although gradually due to legislation and near misses we no longer had to rely on a colleague to put a foot on the line at the scene of a rescue. From being a teenager I always had an interest in climbing and mountaineering, so when I joined GMFRS the idea of undertaking rescues became a passion. Little did I realise that by the time I came to retire I would be the lead trainer responsible for producing and developing training packages for the whole Service. In the early years we would lower a firefighter on a single line – normally the 60m rescue line (hawser laid construction) – with either a bowline around the waist or rescue strops, down a vertical face to rescue a stranded person with the line running under our foot with another person ready to apply more weight if needed. Not only did we lower by line underfoot but also sat on fire damaged roofs removing tiles, slates or loose chimney pots, occasionally securing ourselves by line to the chimney with a bowline. We always carried a fireman’s axe just in case we started to slide down the roof when we could arrest our fall by smashing the axe head through the slates or tiles; however, I have yet to hear of anybody managing to actually do this prior to falling off! Thankfully for the safety of firefighters and the public this practice ceased in the late 1990’s following the introduction of LOLER (Lifting Operations and Lifting Equipment Regulations). From then on any lowering had to have a backup line and also a self-locking belay device (SLBD) – this is a hands free system that locks the rope. Training with roof ladders working off different main ladders. At this point GMFRS had to introduce a whole new rescue kit which included different ropes and hardware. Those firefighters who had done some climbing were familiar with certain pieces of equipment used in the climbing arena but not in a rescue situations as most of the equipment used in climbing is dynamic and for single person use. However, rescues generally involve a team, so the kit needed to be able to withstand a two person load and not of a dynamic structure. GMFRS utilised a 50m kernmantle low stretch rope (LSK) 11mm in diameter. This was known as semi-static due to the limited elasticity of about 5%. This was a big difference from the thick rescue ropes we had been using and also the ropes used in climbing that were dynamic (20-30% stretch). The term ‘Line’ was gradually removed and ‘Rope’ became the norm, although this probably took about 25 years – much to my frustration. Initially, the Service used the figure 8 descender as the main lowering device and the Petzl Gri-Gri as the backup device. This was subsequently changed to another Gri-Gri as the figure 8 was not a SLDB. Initially a sit harness was introduced as a means of attaching the rope to a rescuer rather than a bowline; then a full body harness was issued as this could also be used underneath a breathing apparatus set. Karabiners and slings were added to the kit along with a pulley. A scaffolding rig in use to provide training in work restraint, positioning and fall arrest. The techniques employed at this time generally were those of abseiling and although this seemed a good idea at the time, as equipment and techniques changed it became apparent that the rescuer needed to be hands-free to deal with the casualty’s needs rather than having to control the system as well. Consequently, the adopted practice was to top lower a rescuer to a casualty leaving the team to control the system and the rescuer to deal with the casualty. In the 1990’s we had good equipment, and the arrival of PUWER (Provisions and Use of Equipment Regulation) was a further issue, but my own experience and training at the UK Fire Service College, and that at both Outreach North Wales and Lyon Work and Rescue gave me the knowledge, skill and understanding to confidently move into the GMFRS training department and develop rope rescue into a user friendly system. The training undertaken by GMFRS crews was all done on sloping ground during the 1990’s and early 2000’s, as the Brigade at the time did not have the capability to respond to incidents where a firefighter needed to be lowered to a casualty be means of rope. Following the publication of the inquiry into the Galston Mine incident, GMFRS decided to provide a full capability in rope rescue. As the crews had already received instruction in the use of twin rope systems, the training became relatively easier due to the background knowledge already given. On considering the needs of the Brigade, some equipment change needed to be made to comply with manufacturers recommendations and PUWER , and we replaced the Gri-Gri with Industrial Decenders (ID’s) as these are able to support a two person lower, with additional pulleys and rope grabs rather than using a prussic knot to attach a retrieval system. 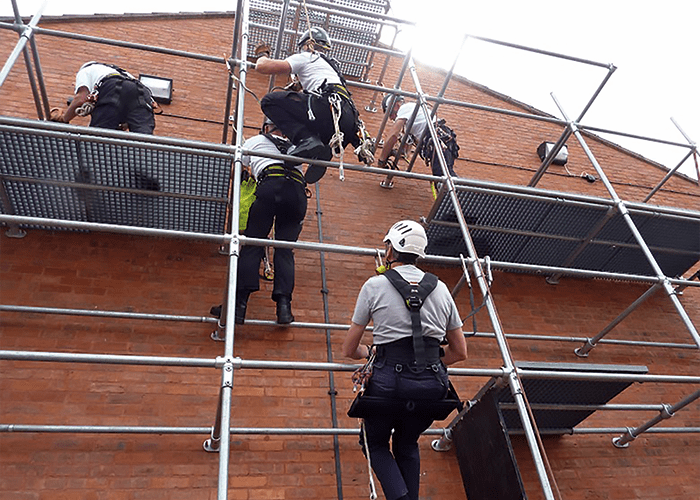 While the Brigade’s rope rescue kit was developing the ‘Working on Roofs and Ladders’ area changed due to the 2005 introduction of the Work at Height Regulations. These Working at Height Regulations apply to all work activities where a fall from any height is likely to cause harm or injury to a person. 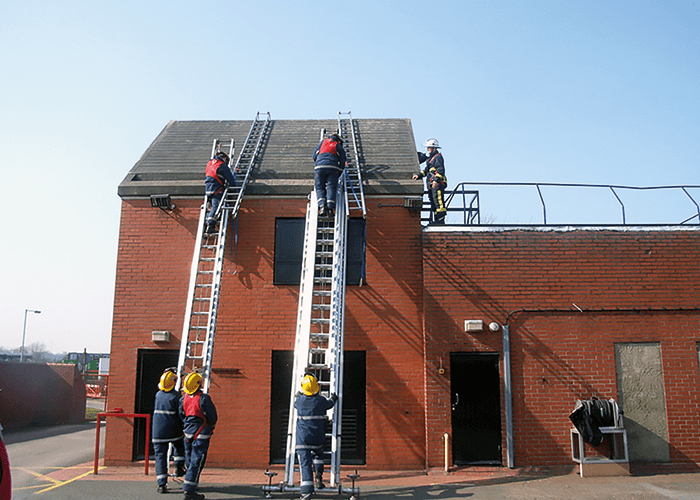 Following the legislation a new safe system of work was introduced to allow firefighters to work on ladders and roofs. This included fixing the roof ladder to the main ladder and securing the head and foot of the main ladder whenever possible. GMFRS crews also received further training in the use of fall arrest lanyards and work positioning system. During this time the UK Chief Fire Officers Association (CFOA) Safe Working at Height Working Group developed a Safe Work at Height guidance for fire services – Level 1 to 4. GMFRS adopted this and every firefighter was trained to Level 2. Level 1 relates to ladders and roof working whilst Level 2 applies to lowering a firefighter to stabilise a casualty. A five floor training tower with multiple line rescue features including crane jib, lift car, and window cleaning cradle. As GMFRS progressed with the training, it became apparent that we lacked sufficient training structures to safely and realistically train all our firefighters. Working with Crofton Engineering Ltd from Cambridge, a long-established company who design and supply various training structures, I was able to develop a training tower to allow the crews to complete set scenarios and practice new skills. We also built a semi-permanent scaffold rig to train our crews in work restraint, work positioning and fall arrest. In 2013 GMFRS committed to providing a full rope rescue capability and I was tasked to develop a ten day course to cover Rope Rescue (Level 3) and Line Access Casualty Extrication (LACE) at (Level 4). As I had already had in place an agreement with Lyon Work and Rescue to provide rope rescue operator training in house, we set about training 54 GMFRS personnel to rope rescue operator level and LACE (this being part of the urban search and rescue (USAR) criteria. The course contained crews from operational stations and also USAR team members. During the course students gained knowledge, skill and understanding in legislation, equipment and techniques and practical experience in climbing structures, building rope systems, pick off rescue, stretcher work, cableway and tripod/quad pod rescue techniques. 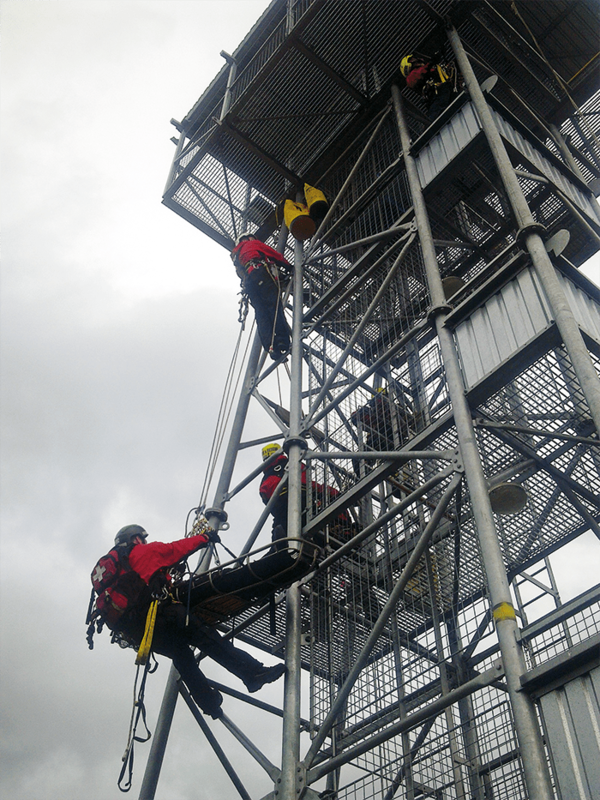 This culminated in the students finishing the course at a 100m tower with various exercises to gain height and exposure experience. Once completed they became part of the newly formed GMFRS Technical Response Unit (TRU). Having trained the crews in Levels 1,2,3,and 4 it became even more important to revisit the training as the skill fade can be quite dramatic if training is not maintained. This became an annual work place assessment; the operational crews received a half day work place assessment covering edge management, system analysis, and lowering and raising personnel. The TRU crews got a 2 day assessments using rural and urban scenarios to include all aspects of rope rescue. To undertake this assessment the GMFRS training and development centre has five trainers all qualified to supervisor/instructor level under both Lyon Work and Rescue certificates and the Service’s own assessment criteria. I joined Greater Manchester Fire and Rescue Service on Monday 7th January 1985 age 23 attending London Road Training School, Manchester. Served at Blackley, Farnworth and Bolton North fire stations. In 2007 I transferred to the Training Centre and completed my teacher training and assessor qualifications, including trauma trainer and rope rescue instructor. Became the Brigade Subject Matter Advisor for Safe Work at Height and Rope Rescue. Since retirement in 2015 I have my own consultancy business in ‘safe work at height and training’, and also work with Crofton Engineering Ltd as a consultant on their training structures.